Bayesian networks based on single nucleotide polymorphisms (SNPs), developed from saliva-sourced DNA, can be used to predict the occurrence of adverse effects associated with chemotherapy. For preventing bone metastases in women with early breast cancer, the current body of evidence does not support the use of osteoclast-targeting agents, ie, bisphosphonates, according to Julie Gralow, MD, director of Breast Medical Oncology at the Fred Hutchinson Cancer Research Center in Seattle, Washington. A wealth of abstracts were presented at the 54th Annual Meeting of the American Society of Hematology (ASH), held in Atlanta, Georgia, on December 8-11, 2012. More than 18,000 hematologists and other healthcare professionals from around the world gathered to discuss the latest clinical developments in research, therapies, and practice strategies. Below are some of the highlights from that meeting. 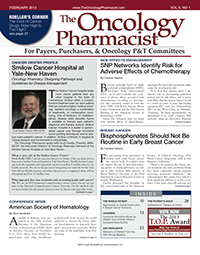 Several studies presented at the 54th Annual Meeting of the American Society of Hematology (ASH) found that a regimen that combines bendamustine with rituximab (B-R) may result in superior outcomes compared with the current standard of care, rituximab plus cyclophosphamide/doxorubicin/vincristine/prednisone (R-CHOP) or rituximab plus cyclophosphamide/vincristine/prednisone (R-CVP), in patients with non-Hodgkin lymphoma (NHL) and mantle cell lymphoma (MCL). Among children with acute myeloid leukemia (AML), the presence of a specific genetic marker known as WT1 SNP rs16754 may be associated with reduced chemotherapy-related toxicity and reduced treatment-related toxic deaths if they are African American or Asian, a phase 2 Children’s Oncology Group trial suggested. In patients who have undergone hematopoietic stem cell transplants, genetic factors may influence susceptibility to congestive heart failure related to anthracyclines used prior to transplant, City of Hope researchers found. Updated findings from the pivotal phase 2 Ponatinib Ph+ ALL and CML Evaluation (PACE) trial found robust activity and sustained benefit for the investigational tyrosine kinase inhibitor ponatinib in heavily pretreated patients with accelerated or blast-phase chronic myeloid leukemia (CML) or Philadelphia chromosome–positive (Ph+) acute lymphoblastic leukemia (ALL). The administration of the histone deacetylase inhibitor vorinostat in patients undergoing matched related donor reduced-intensity conditioning allogeneic hematopoietic stem cell transplants could be an effective approach to reducing graft-versus-host disease (GVHD), according to the first-in-human clinical trial of 45 patients. Memorial Sloan-Kettering Cancer Center (MSKCC) researchers showed that cryotherapy given at the time of high-dose melphalan reduced the incidence of severe oral mucositis and the need for pain medicine in patients with multiple myeloma who are undergoing autologous stem cell support.